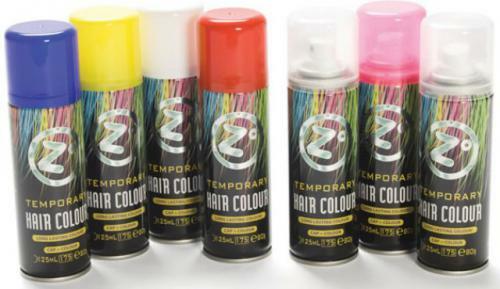 An essential part of any dance routine is coloured hair spray. Not to worry Curly Sues Dance Accessories has you covered with different colours available. Use all-over for a big, bold effect or add bright streaks with intense blasts of colour. Zo Washes Out! Zo is made in Europe under strict quality and environmental guidelines. Zo Hair Colour is non-permanent and will, in most cases, wash out using normal shampoo and conditioner. Use dark and light colours to create contrast and a more dramatic affect. Such as Black and a bright Fluro. Select a section of hair. It may be a chunk, a curl or several strands. Hold it away from your other hair and spray. Repeat to create a streaking affect all over. Use a brush or comb (preferably disposable) to brush through the colour. This reduces the intensity and can create a more tonal look especially when using brown or black. Repeatedly brushing and spraying also helps to create a stronger, all-over colour.